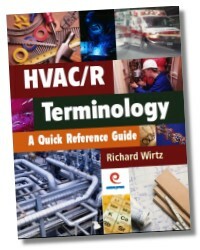 This one-of-a-kind HVAC/R technical reference guide incorporates all the HVAC/R technical terms used in the industry today. It is an indispensable resource for professionals dealing with electricity, controls, refrigeration cycle, heating, psychometrics, boilers, heat pumps, heat transfer, load calculations and more. It covers the entire industry, providing the most comprehensive collection of HVAC/R terms available in one concise location. For those just starting in and seasoned veterans of the HVAC/R industry.